The PC giant reports flat revenue and a modest increase in net income, but sees trouble ahead due to global economic headwinds. 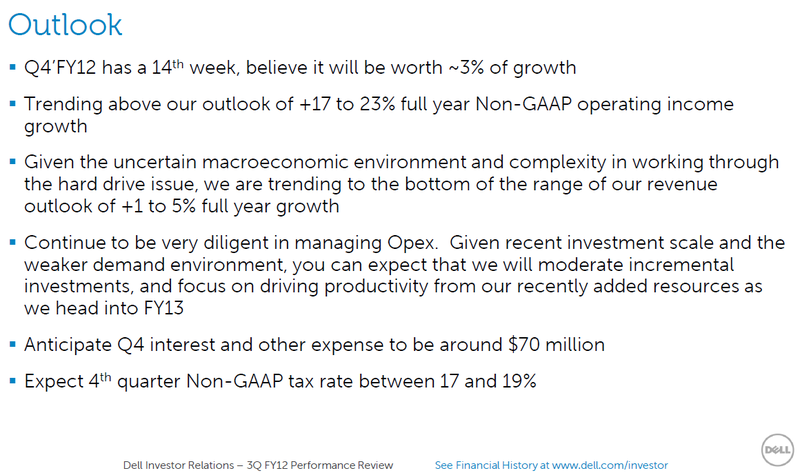 Dell reported better-than-expected third quarter earnings, no revenue growth and provided an anemic revenue growth picture for the fiscal year. The PC maker reported fiscal third quarter earnings of $893 million, or 49 cents a share, on revenue of $15.36 million, flat with the year ago quarter. Non-GAAP earnings were 54 cents a share. Wall Street was expecting non-GAAP earnings of 47 cents a share on revenue of $15.65 billion. Given the uncertain macroeconomic environment and complexity in working through the industry-wide hard drive issue, the company is trending to the lower end of the range of its revenue outlook of one to five percent full fiscal-year growth. CEO Michael Dell said that the company is focused on growing its enterprise storage, server and networking business as well as moving toward on-demand software. The company is posting double-digit growth rates in emerging markets and its enterprise business and investing in research and development. "We're now investing in research and development activities at almost a billion-dollar annual run rate and our earnings per share is up 86 percent over the last 12 months," said Dell. Enterprise solutions and services revenue was $4.7 billion, or 31 percent of revenue. 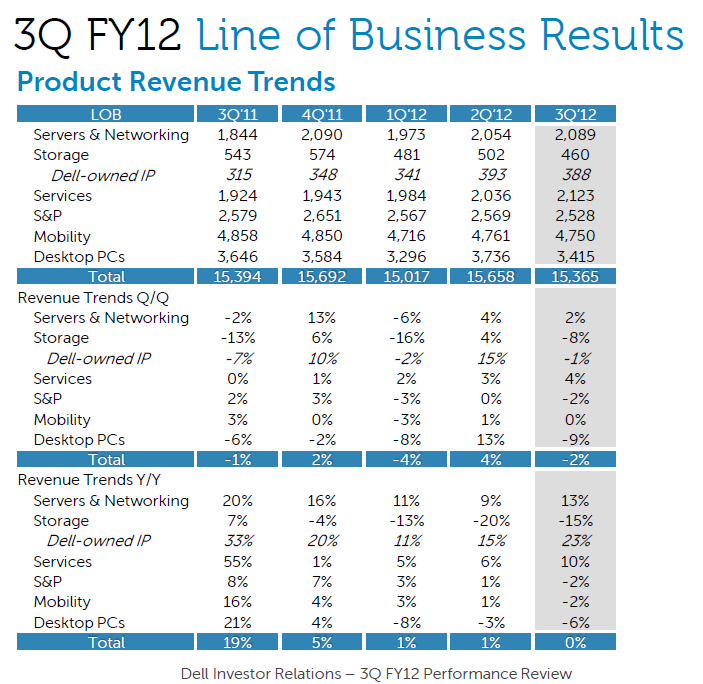 Server and networking revenue was up 13 percent in the third quarter. 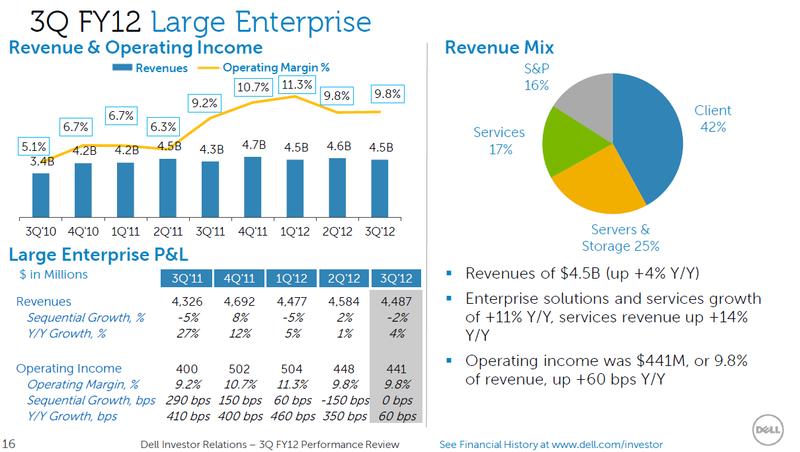 Dell branded storage third quarter revenue--EqualLogic and Compellent--was up 23 percent from a year ago. Services revenue in the third quarter was up 10 percent from a year ago to $2.1 billion. Large enterprise revenue was up 4 percent from a year ago to $4.5 billion with operating income of $441 million. Public sector revenue was $4.4 billion, down 2 percent from a year ago, with operating income of $463 million. 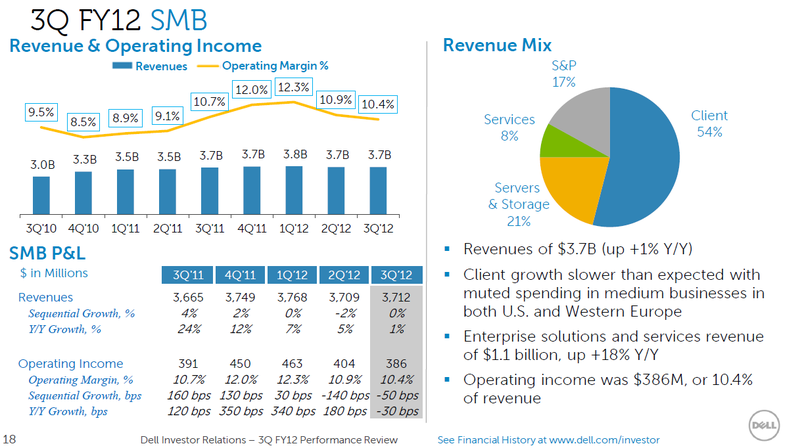 Dell said spending was slow in the U.S. and Western Europe. SMB revenue was $3.7 billion, up 1 percent from a year ago, with operating income of $386 million. Consumer revenue fell 6 percent to $2.8 billion in the third quarter with operating income of $76 million. China revenue was up 23 percent in the third quarter. Brazil, Russia, India and China (BRIC) revenue overall was up 14 percent. This post first appeared on ZDNet's Between the Lines blog.